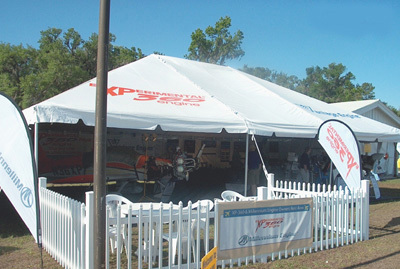 When selecting an outdoor tent top, the first thing that many people look for is durability. The folks at Premier feel the same way and are happy to announce the Premier West Coast Frame Tent Top. Whatever the reason for you needing a new tent top, you won't find a better one than this on the market. The 17 oz "Block Out" top keeps rain, snow, and even UV rays out of your tent. The fully reinforced patches and double reinforced curtain rope are here to let you know that this is a tent top you can trust. Easy to use, reliable, and available in 5 different designs, the Premier West Coast Frame Tent Top is the perfect tent top replacement.